My parents got a new puppy and we finally welcomed him home on Friday. I’m happy to formally introduce you to our new furry friend! He’s only been home for a weekend but we’re already totally in love with him. What these pictures don’t show is how feisty he is. He loves to wrestle with the kitchen rug and bark at it and when you step foot in the kitchen, you better watch your toes! It’s hard to teach him not to chew on you because you’re too busy laughing at him while he scurries towards you. Well, that’s my problem anyway. Got any words of wisdom on dog training? We’re just getting started but we’d love your advice! I got some good tips on Instagram yesterday, and I’m interested to hear what you guys have to say! I’d especially love to hear about any free videos online that you’ve found useful. how adorable! I may have to go out and get one of my own! Oh my goodness! He’s absolutely adorable! Tips for training: Be firm. He’s a little guy, but you still need to train him like you would a bigger dog – as in, not letting him be the boss! That means not letting him jump on people/furniture without permission, pulling on the leash, etc. It’s easy to let that stuff go with little dogs because they’re smaller, but then they don’t learn when they’re young… which can create big problems later. Love those tips! Thanks Lauren! Oh my goodness, Griffin looks like a teddy bear! And what a sweet name. My best advice is consistency. With our puppy there were times when I thought his behavior would never improve (especially when he was on a leash). But over time, he adjusted to the routine. Good luck with your new furry family member! Thanks for the great advice, Lauren! We’re struggling with consistency right now because we have a total of 5 adults in the house who are all helping “raise” Griffin, haha… but we’re trying to make sure that we’re all on the same page! We just got a puppy about a month ago! I totally hear what you’re saying about how sweet they look in photos despite being feisty in real life. We started training our pup, Kona, the day she came home because Corgis really need to learn who’s the boss early on. She learned “sit” the first day, then “lie down” a few days later. Now she has a little collection of commands! Our biggest ally: YouTube. We learned so many good methods from dog trainers with channels on there! Awww, look at that face! He’s adorable! I’m following your responses carefully on this post Kate as our puppy Coco is delicious but prone to toe & shoe chewing! He’s adorable, enjoy! He is sooo adorable!! Just remember to be very consistent with commands–and definitely give lots of little treats! This will help him remember that when he does the right thing, he gets rewarded for it. If treats aren’t close, then give lots of praise and attention. Thanks for the tips, Kate! Congratulations! 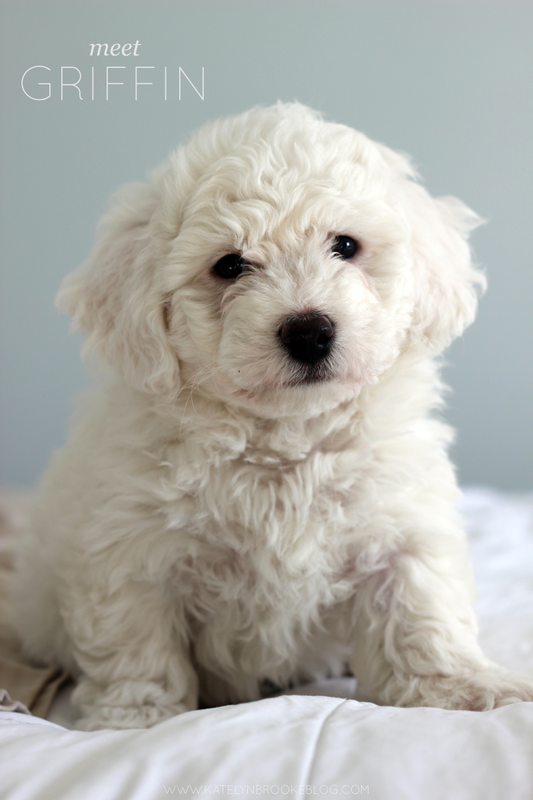 He is just one big ball of white fluffy cuteness. Haha. Sorry for 2 comments, but I agree to give lots of little treats and reward every effort that is pretty close to what you want him to do at first. And don’t repeat commands too often because they lose their punch. My dog knows when I say no that I mean it. With dog training, make sure you train them a little bit everyday and when they do something right make it seem like you just won the lottery and get them all happy and excited but when they do something wrong dont be harsh on them, just dont react and soon they will understand that good things mean treats and cuddles and bad things mean avoidance. Oh, my heart is absolutely melting!! Little Griffin is just the cutest and sounds like such a delight to you and the family. 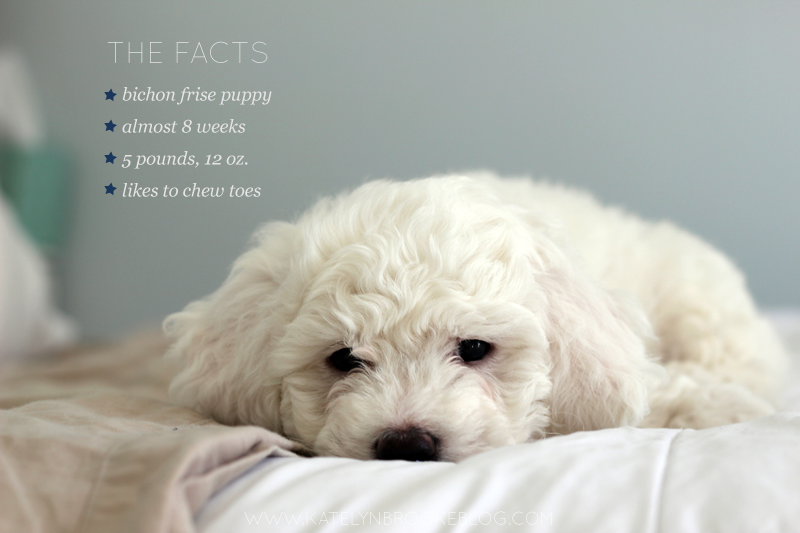 I love bichon frises too; they have such a sweet and mischievous temperament. Absolutely adorable! I want him :D Nice to be back here again, Kate!